It’s hearty and flavorful enough for meat-lovers but still vegan and every bit delicious – spiked with two of my favorite spices, cumin and smoked paprika. I love that it’s so simple yet nutrient-dense. Lentils are such a great, healthy option, packed with fiber, protein, and iron (and not to mention inexpensive). Plus the small mountain of spinach beautifully adds vitamins, calcium, and folate. If you like preparing freezer meals, this is an awesome choice to stash away for a busy night. Hope you enjoy as much as we do! 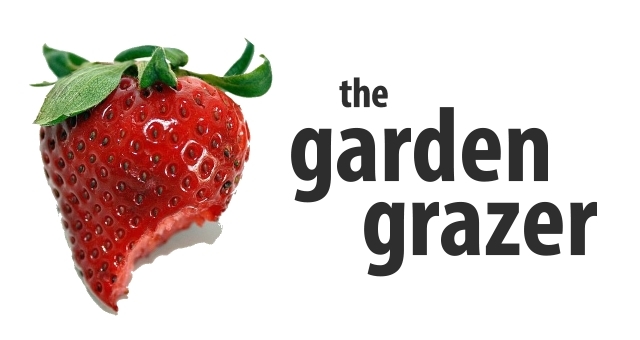 Come join The Garden Grazer on Instagram 🍓 and share a photo if you make this! I love seeing your recreations. 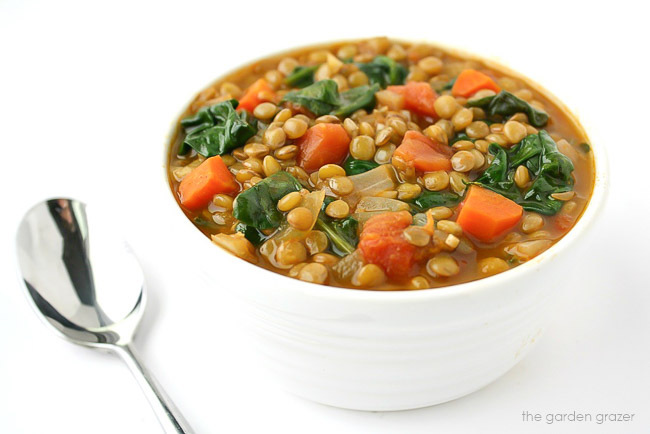 Easy, healthy Lentil Spinach Soup spiked with flavorful cumin and smoked paprika! A nutrient-dense plant-based meal and freezer-friendly. Meanwhile, mince garlic and rinse lentils. Add garlic, cumin, smoked paprika, and salt to stockpot. Saute 1 minute. Add broth, tomatoes, and lentils. Increase heat and bring to a boil. Reduce heat, cover, and simmer for about 30 minutes or until lentils are tender. Add spinach during last couple minutes of cooking. Hi Lori! Aww, thanks for your kind words 🙂 So glad you're enjoying the site!! Happy New Year! Just made this for lunch and it is so delicious!!! Can't wait to get my bean-loathing husband to try it. I can see this going into my regular rotation. Can you tell me the approximate serving size? Thank you so much for the recipe. It is so healthy and delicious. I doubled the recipe for lunches at work! Hi Elizabeth! Yay!! So glad you enjoyed it and have some work lunches ready to go 🙂 I just made another batch this week too – having the leftovers for breakfast on this chilly morning! 😉 Have a great week! We are having this for dinner tonight. It tastes yum! Definitely a keeper. Can I use precooked lentils? Add them towards the end? Hi Nina! Of course! You could reduce the simmer time then too 🙂 Hope you love it!! Is the nutritional information available. Looking specifically for calories & sodium content per serving. Looks delicious!!! Hi Kaitlin. This recipe looks so yummy and I can't wait to try it. Are you able to slow cook this? I work a lot and it's easier for me to chuck it in a pot in the morning before I leave. Hi Eliza-Jane! Awesome thought – I bet this would do great in the slow cooker!! Let me know if you give it a go 🙂 Would love to hear how it turns out! I am craving this soup now, it looks amazing. I love using greens in my soups, it’s such a great way to get them into your diet. Hey Rachel! Hope you love it! I just made this again yesterday (and had leftovers for breakfast today) 🙂 Totally agree with the greens – I can pack SO much spinach into this!! Just made it… so good!!! Thanks for the recipe! Yay Yasmin! I make this all the time 😉 So glad you enjoyed it – thanks for the message! What a wonderful soup!My whole family likes it.I even made a vegan home made broth for it.Its cost effective and the ingredients are readily available. Hi Wendy! I LOVE that you made your own veggie broth – yum!! So glad your whole family enjoyed it 🙂 It's usually quite a crowd pleaser. I almost always have all these ingredients on hand which makes it one of our favorite go-to meals (and yay for it being cost effective)! Thanks for the sweet message – have a great weekend!! I'm making this right now. It's a child rainy day in Virginia. I added a little more chicken bouillon crumbles, a sazon ham seasoning packet and some thyme to richen the flavor of this soup! Tastes great, its simmering now as i type this. Yum! Yay! This is my perfect rainy day meal 🙂 Great to cozy up to. Hope you enjoyed! I made this recipe last night and my boyfriend and I both loved it! I added 2 stalks of celery, 1 Okinowan sweet potato, and used a big bunch of kale instead of spinach because it was what I had in my fridge. I also added Sriracha & avocado to the individual bowls before eating it. I brought leftovers to work today and it's almost better the second day than the first. I will definitely be making this soup regularly throughout fall & winter. Thanks for sharing! Hey Jessica – yay, glad you both enjoyed it! It's one of my favorite go-to soups as well, and I make it all the time. I LOVE your additions. (I've never had an Okinawan sweet potato before. I bet it made it so pretty too!) I agree, the leftovers are my favorite part – I'll eat them for breakfast! 😉 It's such a fun recipe to play around with, hope you continue to enjoy! This soup sounds so tasty, filling, and for those of us who are budget-minded. I have never heard of "smoked parsley." Do I have to go to a store that sells organic food to get this ingredient? Hi! Smoked paprika is a spice with a subtle smoky flavor and rich red color. SO delicious – I use it often! Many stores carry it in their seasoning aisle now 🙂 Hope you enjoy the soup!! Hi Kaitlin: OPPS!! I meant Smoked Paprika instead of Smoked Parsley. Thanks so much for your prompt response; actually, I did find it in my local grocery store. So now, I'm all set to make the soup!! I know both my husband I will enjoy this soup immensely. Heehee, I figured that was a typo 🙂 I'm so glad you found some – would love to hear what you think! It's been my "secret ingredient" for a burst of awesome flavor in many dishes the past couple years. Hope you had a great weekend! Thank you so much for this recipe!! I cook twice monthly for my Church outreach program called Soul Kitchen. We are always looking for low cost, healthy food we may prepare and serve, this looks to be a keeper! Any special advice do you think in increasing this to serve 50 or so people? Hi Carolyn! That's so lovely to hear. How sweet of you to cook for your outreach program, I love that! 🙂 This is definitely a crowd-pleasing yet budget-friendly recipe! Unfortunately I don't have any experience in making it as a "big batch" recipe for that many people so I'm afraid I don't have much advice. Though I'd probably take the help of a food processor to chop all the onions and carrots! I would LOVE to hear how it goes if you make it in "bulk"! 😉 Wishing you a beautiful holiday season! Hi! Oh my, I love your adaptions!! So glad you were able to make it work 🙂 It's such a fun, versatile recipe. Thrilled to hear you and your husband both enjoyed! Wishing you a very happy new year! 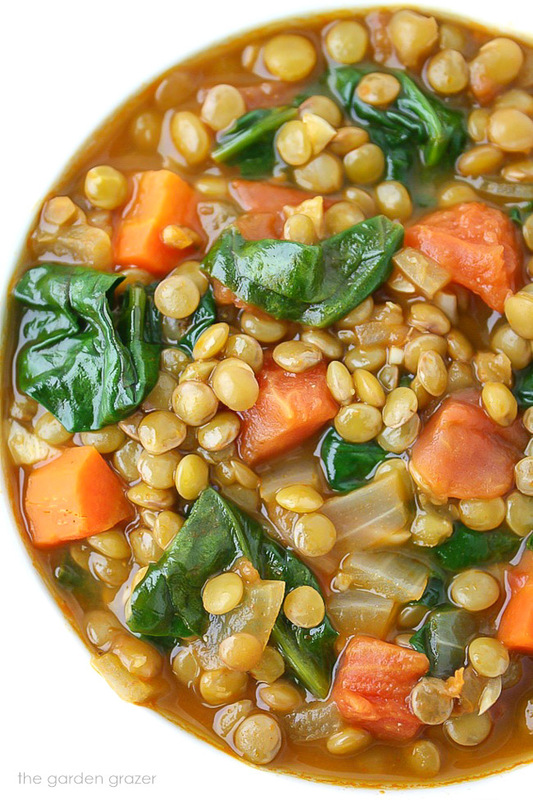 I love lentils and I made this for lunch today and it's sooo delicious not to mention easy. Thanks for the recipe. Will try the red lentil soup next time. Hi Sheryl! So great to hear! Hope you enjoy the red lentil soup as well 🙂 Have a lovely week! Do you think I could get away with frozen spinach instead of fresh? We're in the midst of a snowstorm here, so grocery store is a no go, but this soup looks too good to not have it for dinner asap. Hi Sara! Sorry for the delay – I bet frozen spinach would be great in here as well 🙂 Hope you're staying safe and warm!! On the stove now, and smells delicious! Can't wait to try it. Thanks for a wonderful (and simple!) recipe. Yay! Hope you loved it!! My little ones surprisingly love lentil soups. Thanks, making this for dinner tonight! Hi Lesley! Aww, hope you and your little ones loved it! 🙂 Have a great week! I'm adding potatoes do I saute these with the carrot and onions or add with the lentils? Hi! I just made this again last week with potato! I usually add it with the garlic and spices 🙂 Hope you enjoy! does his soup freeze well? Such an awesome recipe!! I cheat and add sweet Italian chicken sausage. Soooo delicious! I absolutely love this recipe. My husband who grew up hating them and never eating them now enjoys lentils. (Which is surprising) I add potatoes to mine make it a lil more hearty and have even used rotel to add spice in place of fresh diced tomatoes. Great recipe. Made this yesterday and it's so tasty!I added half of a sweet potato, a baby zucchini and an extra can of diced tomato. Now I have enough for lunches all week!Thanks! 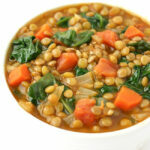 I love lentil soup and will be making yours tomorrow! So easy! One recipe I used previously called for a dash of vinegar at the end. I just add it to MY bowl! (Picky husband!) I always use balsamic vinegar, it just adds that little sumpin'sumpin'! If you are afraid, try in a small bowl or even in your soup spoon! All the wonderful reviews have my tummy growling! Thank-you for sharing! Awesome to hear! Hope you enjoyed it last week! 🙂 Oooh, I LOVE balsamic vinegar – will definitely try adding that next time. Thanks for the great suggestion! Can i have dis post workout as a source of protein due to some problems unable to take protein shake so can i eat dis instead of protein shake??? Just wondering if i can not use the broth and use just the water? Hi….trying this wonderful recipe for the first time. Flavor is awesome, but I am having to add quite a bit of extra broth? This stew was delicious. I added sweet potatoes and held the spinach. Such a yummy, guilt-free, protein packed meal. Thanks for sharing! Hooray! So glad you enjoyed it and I love your swap with sweet potatoes, yum! Thanks for the sweet message – hope you had a wonderful holiday! Just made this tonight after work.So easy to make and so darn good I want another cup (had 2 already)! Thanks for the great recipe. 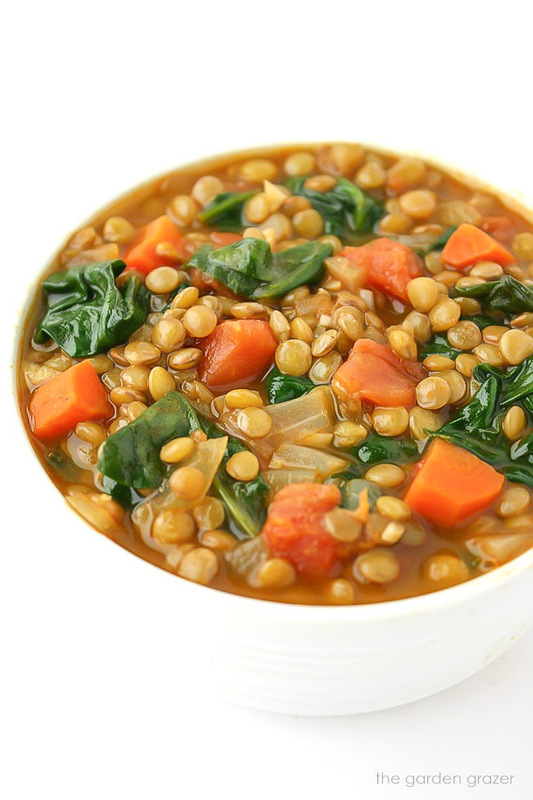 My favorite lentil soup recipe; thanks! I literally just finished making this and it was an absolute hit for me and my family. I love the smokiness of the paprika and it was super quick to make.